What a day it has been at the Seamaster 2018 ITTF World Tour Lion Japan Open in Kitakyushu with Tomokazu Harimoto pulling off a giant upset, the top seed departing from the Women’s Singles draw and the World Champions falling in the second ever Mixed Doubles final on the ITTF World Tour. Look back at some of Saturday 9th June’s highlights with our day two review. There’s no debating the headline of the day which came right at the foot of the Men’s Singles draw as Japanese teenage superstar Tomokazu Harimoto knocked defending Champion Ma Long out of the tournament. Storming into a commanding three games to zero lead, 14-year-old Harimoto held off a late fight from Ma Long to claim what is surely the biggest result of his career to date (11-8, 11-9, 11-7, 3-11, 2-11, 11-6) and will meet Korea Republic’s Lee Sangsu in the last four after the fourth seed pulled off a fantastic comeback to eliminate Chuang Chih-Yuan (11-3, 8-11, 9-11, 3-11, 11-8, 11-5, 11-4). Pushed right down to the wire earlier in the day when he narrowly saw off Liang Jingkun (8-11, 11-9, 2-11, 11-7, 11-3, 2-11, 15-13) China’s Zhang Jike required an even bigger effort in his quarter-finals tie with the host nation’s Jin Ueda, recovering from three games to one down to beat the No.13 seed in another seven games thriller (9-11, 11-7, 9-11, 8-11, 13-11, 11-7, 11-7). Next up for Zhang Jike is a mouth-watering semi-finals duel with Germany’s Timo Boll after he successfully came out on top in his sole fixture of the day: the top seed fell behind early in his encounter with Japanese opponent Kenta Matsudaira but a solid response (12-14, 13-11, 11-3, 11-7, 11-9) sees Boll move to within a single win from the final. Chen Xingtong contributed a big upset in the Women’s Singles event, booking her spot in the last four with a powerful display against top seed Kasumi Ishikawa (11-3, 11-4, 10-12, 9-11, 11-7, 11-9). Defeat for one Japanese star in the top half of the draw but for Mima Ito it was a different story, as she saw off Chinese Taipei’s Cheng I-Ching across six games (11-3, 11-7, 11-13, 8-11, 11-3, 11-6). 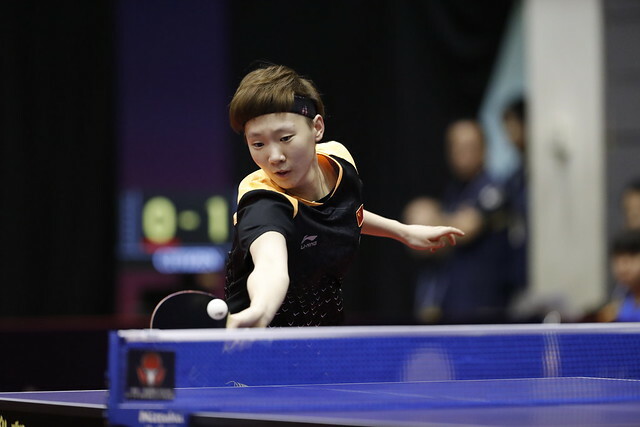 The lower half of the draw will feature an all-Chinese semi-final following positive outings from Liu Shiwen and Wang Manyu: back to playing some of her best table tennis, Liu Shiwen breezed to a four games win against Miu Hirano (11-4, 11-7, 11-3, 11-4) while Wang Manyu saw off Lee Ho Ching (11-6, 11-7, 11-8, 7-11, 11-9) and Mu Zi (11-5, 11-9, 11-8, 11-8) to move through to the penultimate round. 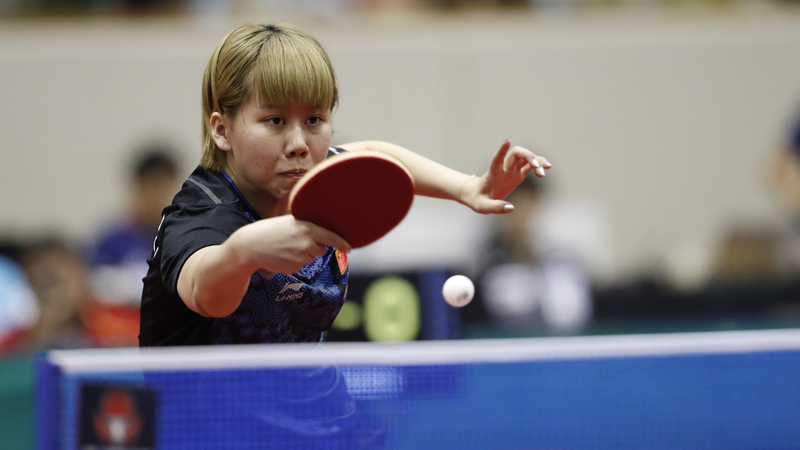 Winner of the first ITTF World Tour Mixed Doubles title in Shenzhen, Chen Xingtong has now reached the top step of the podium in the second edition of the tournament. Liang Jingkun partnered Chen Xingtong in Kitakyushu and in the end, it was a convincing win as the Chinese duo accounted for World Champions Maharu Yoshimura and Mima Ito in straight games (11-9, 11-9, 11-9).